The tech company Huawei, presently under judicial attack in the US, has announced the completion of Schubert’s Unfinished Symphony by the artificial intelligence of a smartphone. The music will be released next month. Not half as smart as President Trump, of course. On January 28, US prosecutors charged Huawei with theft of trade secrets from T-Mobile and violating Iran sanctions. Or what about the simpler “wtf art thou’ ? I find this his is very dangerous. Digitizing music opens the door to the final assault of technology on our world; the assault on the arts. Arts are the “final frontier” precisely because they are intrinsically human. 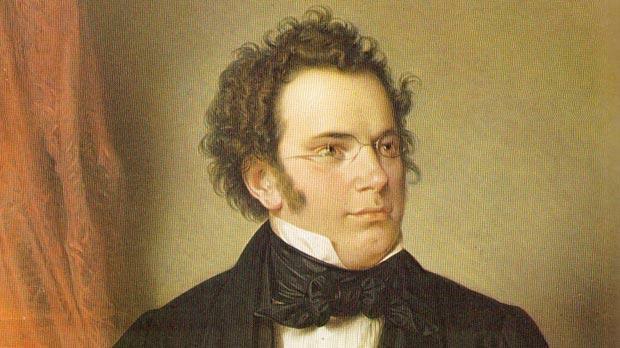 Pathos, creativity and passion cannot simply be synthesized with valuable result; nor the philosophical subtexts Schubert infused the piece with. And Schubert is not even the worst target; imagine an existentialist such as Brahms or Mozart, with all the sensitivities and intimacy in their music. That cannot be synthesized. The moment that happens, humanity loses what is best and unique about it. Of course I can’t jump to full conclusions just yet, but I do not expect much humanity to shine through the “completed” symphony. It is a worrying development. We already see AI ‘creating’ figurative paintings à la Rembrandt – not copies, but ‘in the style of’. The adoration of technique for its own sake is dehumanizing. There is this crazy ‘movement’ of ‘posthumanism’ that wants to replace humanity by combinations of human material and advanced robots and computers, which is supposed to be a better human race – one wonders: better for whom? And for what? But the assaults on the arts have begun much earlier, by dehumanizing them – especially after 1945 – with abstract painting, concept art, sound art, etc. as presented as ‘progress’. Sophisticated technique can easily be combined with brutish barbarism, as history has already demonstrated. Dehumanizing the arts is a prelude to dehumanizing the rest of civilization because the arts are the symbol of the human condition as it really is. It’s the beginning of the end. But, really, I think we are halfway there already. From AI to the unprecedented collapse of voices and standards, we will soon hit bottom. The sorry Maria Callas hologram charade is a case in point. Next up is Glenn Gould. And as the technology improves, we will see more and more of these shams and fakery. It will reach a point in the future where no one will die or disappear, recreated digitally to (deadly) perfection. Maybe, but they will not be there, only simulacrae. Relax, it’s Huawei. They just stole the work of another real composer. Did they steal the first two movements from Schubert? This isn’t an assault on anything. It’s a PR stunt. Maybe the result will be worth a listen, maybe it won’t. Either way, it won’t change a thing. Nobody died. What’s more interesting is that they tapped into the interest in Classical music in China for this promotional gimmic. Can you imagine a British firm doing the same? They’re be more likely to do something with sport or pop music. What, a Chinese company making counterfeit Schuberts, what else is new? Schubert is planning to sue Huawei for theft of trade secrets as well. There was a episode on Amazon Prime’s “Mozart in the Jungle” that riffed on just such a scenario. Let’s wait until we can hear it before panicking. It might be better than some completions by humans. Might be worse. 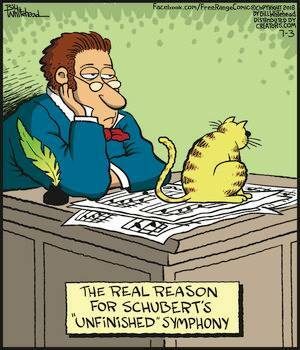 Maybe then it can complete PDQ Bach’s “Unbegun Symphony”. You may well have a point. Completions can be extremely cautious, amounting to little more than a tentative-sounding laundry list of extant fragments. The best, like that of Elgar’s Third, seek to make a real and convincing composition in its own right. Does Kurt Atterberg’s estate have to return the $10,000 to Columbia Records that he won for finishing it? Perhaps a more fitting challenge would be for AI to compose the beginning of Peter Schikele’s “Unbegun” Symphony. What’s the big deal? Several other real, live humans have written “completed” versions. A version by smartphone has every bit as interesting as a singing dog, but of no greater value. Has anyone read any inspirational quotes made by the AI “Inspirobot’? You get things like this: ‘Play with. Promote. Entertain. Sing. Embrace.’ AI imitation Schubert is going to be even worse. Holst Pluto. Art of Fugue. Mahler 10. Beethoven 10. Moses und Aron.